The laminate and composite rifle stocks from GRS are something quite special. But how are they made? Matt Dubber spoke with our chief in command, Oscar Haugen. The result is a beautiful video where you can take a look behind the scenes. - "I recently had the privilege of traveling to Norway and getting a first-hand look at how these beautiful works of art are made. In this video we chat to Oscar Haugen of GRS." We started the company in 2009 – as part of a natural generation change. The company was originally founded by my mother and father in 1984, producing hand carved furniture. In many ways, the interest in handcraft and the passion for shapes and design were brought to us when we were kids. In 2009 the industry was in the middle of the financial crisis. So we had to do something. We had lot of people working for us, and we needed to keep their jobs. The banks also wanted their payments. So we took what we had – which was a lot of experience from shooting and furniture production. Looking back, its kind of an entreprenual journey that we’ve been through. And the passion for craftmanship that we learnt from our parents, has been fundamental. Making the perfect rifle stock requires passion, experience and the hunger to create. I was a sharp shooter for the Norwegian army for a long time, both as a soldier and instructor. So we knew what worked in the field. And we knew production. So we took something traditional, as a rifle stock is, and introduced something new into it. This way, the ergonomics and the adjustment systems became key features of the GRS rifle stocks. And we combined that with the passion and knowledge we had from shooting. We are true passionate about what we do. We hunt a lot. We shoot a lot. We keep developing all the time. Even though the public haven’t seen a lot of what were working on. There is constantly new things coming out in the years ahead. Why? Because we want to help people shoot as good as they can. And we want to develop products that help them do that. From ordering a rifle stock – to have it customised in your hands. The journey of a rifle stock actually starts with you coming in to the store, deciding which type of model you want. We make each rifle on order. We dont do mass production. When you decide which stock you want, the color, the inlet, and all extras are being placed as one unique piece of stock. The process of making a rifle stock. Lets say we start off with laminate blocks. Inside those it could be potentially 1700 combinations due to the number of colours, models and inlets that we have. First, it goes into the band sawing to shape the rough outer surfaces, then the surface is being utterly shaped for the rest of the production. From there, it goes into the CNC-machine. Potentially, we can make 35-40 different inlets depending on what you want. The CNC machine is the last part of the mechanic side in creating the stock. From the CNC-machine, the rifle stock is being handed over to our GRS Crew, who put their passion into the finishing of the stock. We have a very good team at GRS. Most of our employees are either hunters or shooters themselves. Many of them loves fishing as well. You might say they truly know what it takes to make a GRS rifle stock. As you can imagine, a laminate stock is not created by a machine. It is hand crafted. 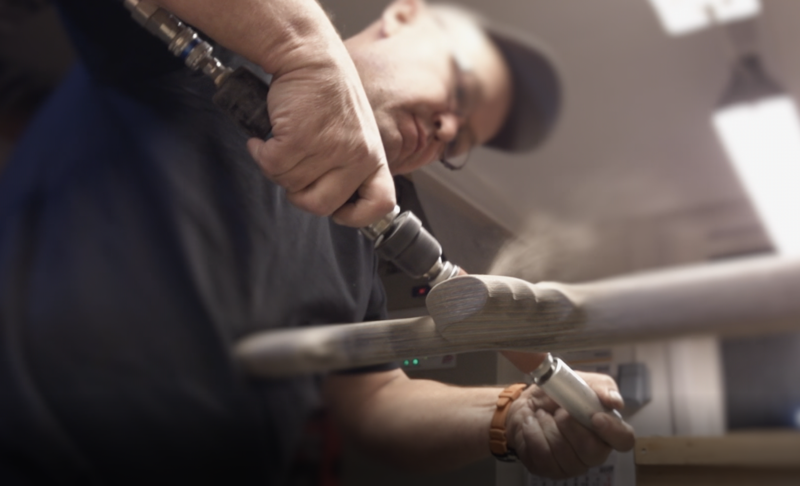 For each rifle, 9 different employees have put their hands and passion into the making. So its not an automated process at all. When sanding is done, it goes into oiling. We have 2 layers of oiling that cures over night, baking it into the stock. From there, it goes into assembling. This is where the adjustment system is being attached. Every adjustment system is hand-fitted to the stock. Then, it goes into packaging and distribution. Adjustable rifle stocks make people shoot better. All our rifle stocks are adjustable, because people are different. If you make a fixed stock, it will always be a compromise for your shooting position. Also, your ergonomic changes in different shooting positions. Its a big difference between standing, sitting and laying on the ground. Its not rocket science, but we recognised this a long time ago. And that is why we made the adjustment system the way it is. Obviously, having the correct length of pull, and a full contact with the cheek-piece, adds a lot of stability into the shooting position. This makes you shoot accurate. The grips that we have (which are off-centered and angled out) removes tension in your arms. So when you shoot you are more relaxed. And the recoil transfers neatly in your body. Keeping the rifle stocks in Hornindal, Norway. Hornindal is quite a sceneric place. Its kind of rural, and we like it that way. We spend a lot of time travelling all around the world, so coming back here is always nice. There are not more than 1500 people living here. And if you take a short walk from the factory, you’re in the woods. You can go fishing, hunting, or whatever you like. If not paradise on earth, its close! We want to keep as much production as we can in Norway. We want to contribute to keep the industrial work places in Norway. If we loose that, its very hard to get it back. That is why we want to employ people from the local community, and create value for the entire community by having the stocks made here. Looking forward – introducing The GRS Bifrost. We see that people feel the benefit of GRS Rifle stocks, and people are starting to change their entire «wardrobe» of stocks to get a GRS Riflestock. We actually talked to a guy in South Africa who had 26 GRS rifle stocks (and he bought 3 more when we were there) Thats what you can call an enthusiast! In the beginning, we started producing laminate stocks. In 2013 we introduced Bolthorn, which was our first chassis stock. Chassis stocks is a different kind of market. Its not a bout the aesthetics. If you only focused on the shooting itself, we believe its the best stock we ever made. Then, we made the Berserk – which got very popular. As far as composite stocks goes, its one of the most advanced out there. The shape we were able to put into it, was the same shape as a laminate. This year, we are introducing GRS Bifrost. Its a composite stock as well. It has more adjustability. It is stronger. And we are doing left hands and more inlets. Getting customer feedback is the key to success. In many ways, Bifrost ticks off all the boxes we weren’t able to fulfil with the Berserk. Its gonna be quite interesting to see how the community responds. We are looking forward to travel the world to show GRS Bifrost to our customers. And the feedback we get is more than helpful. Because this journey is not about us. We are doing it for you.